Much like baby wipes, white onesies, and reruns of The Office, coffee is essential in our home, particularly in this season of parenthood. It’s that little thing that gets me up with the birds so I can enjoy a bit of solitude before rolling into our daily rhythm, whether that means a morning of homeschool crafts or a list of errands to run. I love that moment when I can slowly, slowly, slowly take that first sip – it always holds so much possibility for the day you know? I came across this quote by Nana Hoffman awhile back on a mug that said, “Before coffee I’m a hot mess. After? I’m a wide awake hot mess. So there’s that.” Hilarious but true! Coffee is that familiar nudge that helps me organize my often-jumbled to-dos and get breakfast going for the kids, so bless it. 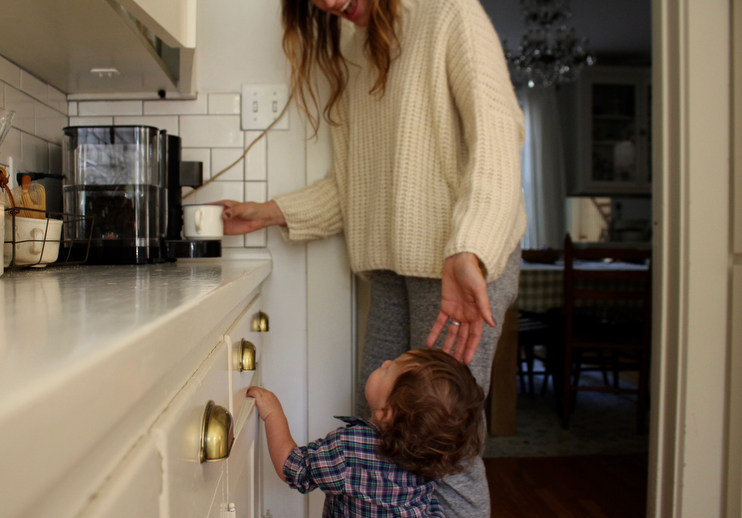 Beyond the practicality, and giving us parents the kick in the pants we need to do our thing, starting with a warm mug in hand is a calming way to start the day for me. Starbucks recently reached out to see if we wanted to try out their new in-home brewing system, and given our need love for all the coffee, we were just a little excited to partner with them. 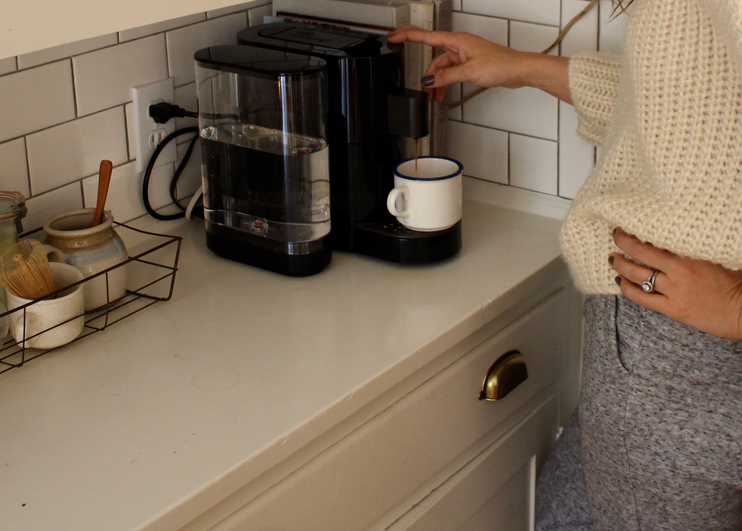 They’ve just launched a new single-serve Verismo® System that makes both simple, cups of coffee + espresso drinks and being able to make these things quickly and easily in our home is wonderful and something I think you homebodies will appreciate, too. Everyone I know seems to have his or her own unique coffee ritual. For Andrew and I, it’s something we share together each morning. On days I am especially tired he makes it. On days he’s got an early meeting I do. It’s also the special thing we treat ourselves to on Sunday mornings at the café down the street before going to church. Our rituals aside, it’s the humble drink that reminds me of both my papas. Till this day when I smell a weak tea-like decaf brew or anything like hazelnuts, I think of my dad’s dad, my papa John in his worn cable-knit sweater and Irish flap cap drinking a weak cup of decaf. When I see or smell coffee and doughnuts together, I think of papa Donnie, my mom’s dad, and the way he dunks his fresh-baked sweets in his coffee with extra creamer at the farm table in the kitchen. He used to let me have a small mug next to him and I always felt so big sitting there with the farmers. It’s a simple drink sure, but there’s so much behind it. I just love how simple pleasures like coffee can bring people together, no matter where you live or what you do. It can launch you back to the past and help you appreciate the present. It’s a drink that we associate with closeness and a drink that’s good no matter what time it is (college taught me this!). So Andrew and I were intrigued to try out the Verismo System for a few reasons. We’ve had an espresso machine before and it was a decent machine, but overall pretty cumbersome, messy, and loud. This one is the opposite. It’s really quiet which I appreciate, especially the Verismo® Milk Frother, which I have been using in the afternoons when making a coffee treat while the boys take their nap. I never used to take the time to make an actual frothed-milk coffee drink at home, but with this I can do so in a pinch. That’s something for someone who’s not barista material or very coffee literate. And we all love those afternoon pick me ups! This in-home brewer is also not a monster-sized machine, which is very important to us. It fits nicely on our coffee bar hardly taking up any room—a bonus for minimalists or anyone who values their counter space. Just as some situations call for the art of slow and restful pace, others call for a bit of speed and convenience. When making a roast for example, I love that I’ve got options. There are times when using my cast iron Dutch oven is better than my crock pot, and there are sometimes when it’s not. Then there are other occasions that using my pressure cooker is just the ticket for our roast supper. Options are great in the kitchen, and although I absolutely value the slow ritual of coffee making I can also very much appreciate making an espresso drink on the fly as a treat for myself on a slow afternoon. That convenience factor is perhaps my favorite part about this particular brewer. Being able to whip up a frothy cappuccino in two minutes is fantastic. We’ve had several types of coffee makers over the years but we haven’t had the best luck with a simple, no-fuss machine that can make all that this one can, with the actual coffee being as good as what you can order in Starbucks® cafés, which we do quite often. So my takeaway fellow coffee lovers: if you are wanting more brewing options at home with a simple but beautiful machine to do so, I think this option is a really lovely one. I am grateful to have been able to try it out and share it in this space with you. If you are indeed someone who enjoys a range of coffee beverages like we do, I think it would be a great item to put on your Christmas list! This post is sponsored by Starbucks however all words, opinions, and photography are my own. I thank you dear reader for supporting me, along with the brands that help support this space and make Homesong possible. That drink looks delish! I wish we had a milk frother so that I could make lattes once in awhile. 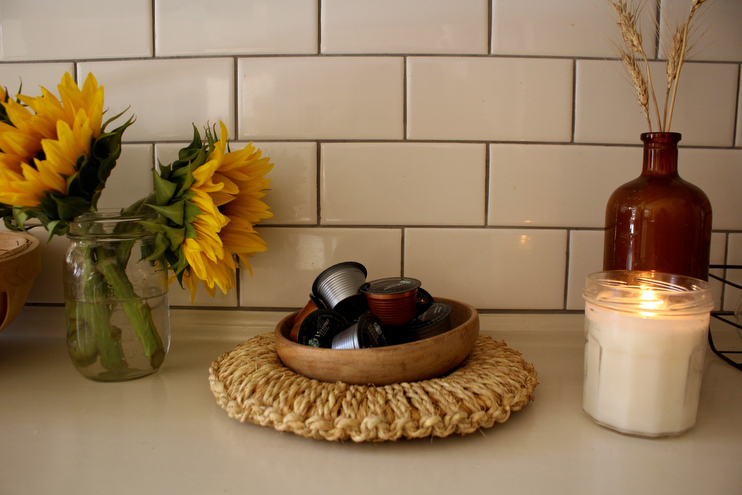 A few months ago we got rid of our coffee maker in favor of a pour over to save counter space #apartmentliving. Oh Amanda I love this! First the pictures are gorgeous, and secondly I feel the exact same way. Coffee is sacred in our home. I go to bed thinking about it and actually am excited to pull myself out of bed knowing that I get that cup of coffee. I love the idea of this machine.I am not much of a barista, but I have recently come to at least differentiate between really good and not so good coffee, and if I was able to make a good drink in a quick time, It would be a dream! Thanks for sharing this.